The headwaters of Image Creek are seen occupying the right/upper portion of the image. Table Rock's summit lies just out of view on the right edge of the picture. The Divide Trail is visible switchbacking up to the saddle on the north side of Rooster Rock. We camped at the saddle early one June, and found the meadow a beautiful location. The entire green swath visible in the picture was awash with wildflowers of every description (the image above is not so green because it was late summer). Note the big, silver evergreen trees that jut up out of the forest so strikingly; these are probably Silver Fir. Just above the main peak of Rooster Rock you can see a road cutting across a hillside; this is the road that goes to the Table Rock Trailhead; at the point you see it in the image, it is at about 2900 feet elevation, and is climbing out of the canyon of Image Creek (the two branches of Image Creek have their headwaters on the northern flanks of Rooster Rock). 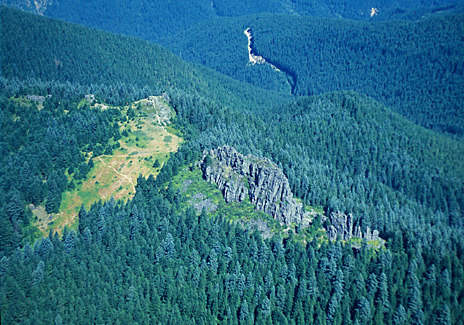 The Table Rock fork of the Molalla River runs out of sight within the deep canyon at the top of the picture. 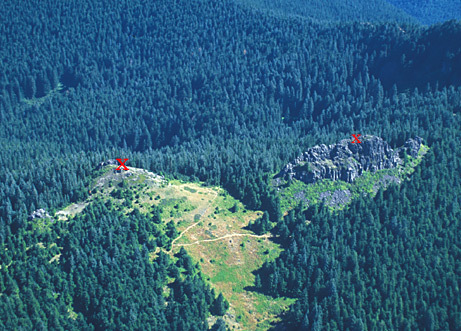 The Red X seen on the left parks the location of a great little rock scramble that puts one on top of a wonderful viewpoint. It is the spot from which I took a picture of Table Rock which several editors have been quite enamored of (click here to see the image). It is also the place from which the big panoramic image was taken (click here to see panorama). The Rooster Rock fork of Image Creek has its source in the wooded bowl visible in the center of the picture.